Myself and others have long talked about how games such as paintball or airsoft (or anything else for that matter) seem to attract cadres of people who tend to take themselves far too seriously. I won't go into specifics, but chances are many of you have encountered exactly the same thing. However, there are those of us that prefer to take it easy (eh), and see games for exactly what they are: games. But it's kind of hard to band together under a banner of relaxation, especially since that requires a fair amount of effort and dedication (which can easily harsh on your relaxation, dude). But even if you find such a solution, where's the fun in just saying you're relaxed? Of course you have to poke fun at those that don't at the same time! What does JAGER mean? Well the badass German word for hunter is Jäger, but that's definitely not what JAGER stands for. 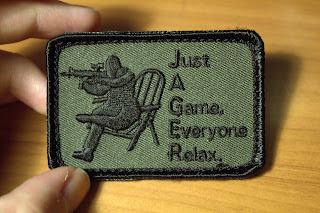 JAGER stands for (as seen above): "Just A Game, Everyone Relax"
This is cemented with the image of a tactical operator sitting in his tactical Adirondack (or Muskoka) chair, in tactical relaxation position, taking aim with his tactical carbine. Tactically. Thus the JAGER patch was born. Stitched in black on mil-spec (so I'm told) Olive Drab, with excellent quality I might add (the pictures barely do it justice), this patch is velcro backed out of the package, and includes the other part of the velcro backing thingy so you can sew the backing thingy on to stuff if you'd so like. Available through Crypsis (click for product page), I'll have them available in more colours in the future if they sell well. Maybe other JAGER products as well, we'll see. So if you're a fan of takin' it easy, or just have an amount of disdain for those who try to ruin your fun through taking things too seriously, tell your friends about the JAGER patch! Or don't. Whatever you'd like really. No skin off my back.